Second center page is hanging on by one staple. Also included is Doom Patrol (2004) #1, 5, 7. Also included is Doom Patrol (2009) # 5, 8, 10, 14, 15. You will get the exact book in the photo above. Just search for Comics To Astonish on the world wide web. If you want to find out how to get your own books Signature Series CGC'd just google us at Comics To Astonish for details. DOOM PATROL. STRANGE ADVENTURES. All have a 12 Cent Cover Price. SILVER AGE COMIC BOOKS. #22, 23, 27, 29. Published by DC Comics in the 1960's. Included in Lot. Will not be responded to. Unpaid Item cases are automatically opened after 48 hours. Characters: Doom Patrol [The Chief [Niles Caulder] (origin); Negative Man [Larry Trainor]; Elasti-Girl [Rita Farr]; Robotman [Cliff Steele]]; General Immortus [as The Baron] (villain). Doom Patrol / comic story / 25 pages. (Colors), ?. (Letters). Character appearances: The Chief; Negative Man; Elasti-Girl; Robotman [Cliff Steele] (all as the Doom Patrol); General Immortus (villain) Part 1 ----------- Your Free Trip Around the World! Illustrated by Bruno Premiani. DOOM PATROL #90. Featuring the Doom Patrol in. "The Enemy Within the Doom Patrol". DC Comics - Silver Age. NO MATTER HOW MANY COMICS YOU BUY! (Excludes CGC & PGX Graded Comics). Cover by Bob Brown. The Deadly Sting of the Bug Man (part 1), script by Arnold Drake, art by Bob Brown; The Doom Patrol put on a public display wherein Robotman dives off the hand of Elasti-Girl and is saved at the last minute by Larry's Negative Man form; This ends with Robotman almost face planting into the ground; hes humiliated when a pennant gets stuck to his face; Larry reveals to the others that he doesn't want to always rely on his Negative Man form and be a real man and fight for himself. 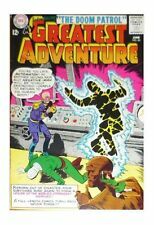 This MY GREATEST ADVENTURE#80 is graded CGC 8.5. Nice solid copy with no finger dents. Front cover has nice vibrant colors. My Greatest Adventure#80 is very hard to find in this kind of High Grade CGC 8.5 and still undervalued for being a Book with such major DC Universe characters. Near Mint condition, and tap the link: Read More for grading details for this Doom Patrol comic book, Doom Patrol (1987 series) #5 by DC,Vertigo comics, and tap Read More to knock down the total for this Doom Patrol comic. Doom Patrol #91, #92, #96 and #97 as a lot of 4 (DC)(1964/1965) in fine to very fine 7.0 condition. Very nice complete copies with no missing pages and nothing clipped out. All staples attached to cover and centerfold. DOOM PATROL #99. FIRST APPEARANCE of BEAST BOY (TEEN TITANS) ! Item: the Doom Patrol #107. Publisher: DC Comics. Other Info. DOOM PATROL. All have a 12 Cent Cover Price. Published by DC Comics in 1964-1965. SILVER AGE COMIC BOOKS. Ce nt er p ag e is detached as you ca n se e in photos so p le as e se e photosb ef or e purchasi ng. No t a professionalg ra de r so i f youlike mo re p ic s pl ea se m es sa ge m e. T ha nk you. "The Death Of The Doom Patrol" with story and art by Arnold Drake and Bruno Premiani (pencils and inks) (16 pages) featuring the introduction of Mr. 103, the Atomic Man. 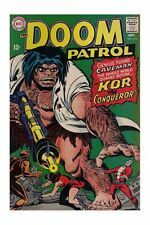 Doom Patrol #98 is cover dated September 1965 and was published by National Periodical Publications, Inc., better known as DC Comics. Here is a cool issue of DC comics' DOOM PATROL #103 from 1966. DOOM PATROL #103 is in Good condition. There is a spine roll. There is a 3/8" tear to the lower, back edge. This comic is so cool! I would call it around a 3.0 gd/vg out of 10 condition. See pics and judge for yourself before purchasing as grading is subjective. The grading is only our opinion and we are not responsible if you choose to have it professionally graded after it leaves our possession or interprit the grading scale differently. Arnold Drake (Script), Bruno Premiani (Pencils), Bruno Premiani (Inks), ?. (Colors), ?. (Letters). --- cover Bruno Premiani. Feature Story: Doom Patrol. --------- ------ ---------------from DC from 1967--- ----------------------------------------------------------. Feature Story: Doom Patrol. --- cover Bob Brown. --------- ------ ---------------from DC from 1968-------- --- ----------------------------------------------------------. It is very important to us. We will take great care in processing your order. Doom Patrol #99 - CGC 8.5 VF+ DC 1965 - 1st App of Beast Boy (Changeling)!!! Beautiful CGC 8.5 (VF ) example - Off/White toCream Pages with Excellent Gloss quality! Doom Patrol #99 DC 1965. "The Deadly Sting of The Bug Man!". -No missing pages or cut-outs. -Both staples attached. Doom Patrol 4th series (2004) 1-18 Complete Run DC Comics Super High Grade Gems! If you need more photos just ask. Picking up in the wake of the events of "The Tenth Circle" saga in JLA, this series reunites Robot Man, Elasti-Girl, Negative Man and Niles Caulder with a host of edgy new super-heroes! It is in good readable condition. It is being sold unrated. Included are the following I will always try to accommodate any special requests. 1st DOOM PATROL, Negative Man, Elasti-Girl and Silver-Age Robotman. Key issue. My Greatest Adventure. Publisher: DC. Issue: 80 /Year: 1963Condition: VG . This includes CGC, PGX and CBCS graded comic books. Cover art by Bob Brown., script and art by Howard Purcell. Grade: GD- 1.8. Published 1964 by DC. This is a low grade item. The story will be complete and readable, butthe item itself will have major defects. Arnold Drake (Script), Bruno Premiani (Pencils), Bruno Premiani (Inks), ?. (Colors), ?. (Letters). Feature Story: Doom Patrol. The Brotherhood of Evil makes their move against the Doom Patrol. ------check out the pic for a great look--------------------------------------------------------------------------------- ----------------------------------------------------- - grade stripped. (From the estate of my dear friend Jerry Weist (1949-2011). 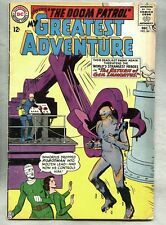 DOOM PATROL #95 (DC 1966), VG condition. It will be over the next few years! There is SO much wonderful stuff). Near Mint condition, and tap the link: Read More for grading details for this Doom Patrol comic book, Doom Patrol (1987 series) Trade Paperback #4 by DC,Vertigo comics, and tap Read More to knock down the total for this Doom Patrol comic. We will have hundreds of Silver Age comics listed in the coming months. Pages are light cream and supple. Near Mint condition, and tap the link: Read More for grading details for this Doom Patrol comic book, Doom Patrol (1987 series) Trade Paperback #2 by DC,Vertigo comics, and tap Read More to knock down the total for this Doom Patrol comic. Mandred the Executioner. Doom Patrol # 109 1967. Most of these are priced at less than 50% of value so a great price for you. COMIC IS IN VERY GOOD CONDITION, HAS A BLEMISH HERE AND THERE, BUT SOLID ISSUE. VERY READABLE. Final issue with new material. Cover by Joe Orlando. The Beginning of the End! 36 pgs., full color. This is a mid grade item. Published 1968 by DC. Grade: VG 4.5. Item images. Near Mint - condition, and tap the link: Read More for grading details for this Doom Patrol comic book, Doom Patrol (1987 series) #13 by DC,Vertigo comics, and tap Read More to knock down the total for this Doom Patrol comic. DOOM PATROL. IN GOOD CONDITION. FREE Trial!